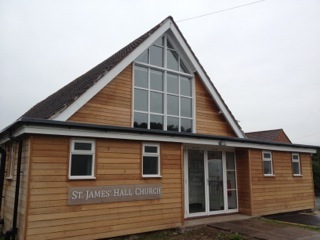 St James’ has a rich place in the history of the Grove and Lodge Farm, as a place of worship and hosting community events - meeting the community's needs in the name of Christ. With the refurbishment of the Hall Church (in 2013) we want to develop our relationships with the community and work together to explore the place of church in the community today. We are thankful to God for all that has gone before, and for the recent developments that we see. We believe God is doing a new thing and we seek to join in with all that God is doing. We seek to be a Christ-centred community founded on prayer, developing relationships with those in the community, and drawing them to Christ and a life of discipleship. We seek to be church that grows organically from within the community, with a willingness to live in faith, and to take risks, recognising that this needs a willingness to make mistakes as well as celebrate success. Building relationships with each other and community. Christ centred rather than church centred, a community focussed on Jesus and belonging to the wider community - making disciples, rather than just establishing a new service, be church rather than at church. Thursdays 4.30pm to 5.30pm Youth Club for School Years 5-8, Games, creating food and fun!